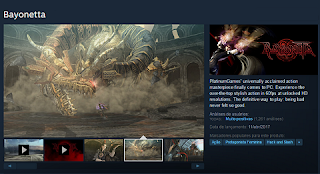 Bayonetta is a third person action video game developed by PlatinumGames for Xbox 360, PS3, Wii U and PC. The game tells the story of the last survivor of a witch clan that must fight against forces of darkness, light and chaos, trying to strike a balance in the universe. When she is resurrected 500 years after her death, the witch must understand the motives of the battle and fight for the future of the world. - Disk space: 20 GB. - Video Card: GeForce GTX 760 / Radeon HD 7870. With everything ready, follow the steps below to download and install the game on PC. Step 3. After buying the game, go to "Library" and select "Games". Then find the title "Bayonetta" in your list and click the "Install" button. Select the folder where the game will be installed and click "Next." The installation will be done automatically after the download ends.